...well, that's a mouthful of a title for a blog post. 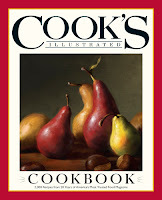 Anyways, next Wednesday, 11/9/11, America's Test Kitchen is throwing an exclusive invite-only cocktail party to celebrate the launch of the Cook's Illustrated Cookbook, and I've got tickets to give away to two diehard ATK fans. We can hardly believe it's been 20 years since Cook's Illustrated published its first issue. To mark this occasion, we've gathered all of our recipes together in one landmark cookbook. We are celebrating the launch of The Cook's Illustrated Cookbook by hosting a private cocktail party at the home of America's Test Kitchen, and would love to invite two lucky Boston Food Bloggers to join us. To enter, simply leave a comment on this post about what makes YOU the biggest ATK fan. The contest will close at 10pm this Thursday, November 3rd, and ATK will be selecting two winners based on your responses. The event will take place from 5:30pm to 7:30pm on the 9th in Brookline. Christopher Kimball and members of the cast will be in attendance. Update: The giveaway is now closed. Congratulations to the winners: Oh Cake and A Plum By Any Other Name! I'd love to go and be able to mingle with actual people from America's test kitchen! This new cookbook is a must buy for me. I think this book and event are a perfect way to expand my knowledge of cooking good food! I love America's test kitchen I now have 4 cookbooks including the latest and they do not dissappoint. I haven't made a dish I don't love yet. And all my friends think I'm this culinary genius. I would love to meet some of the people behind the scenes. Pick me!